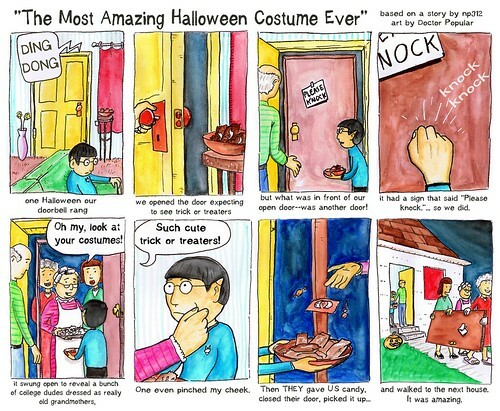 I grew up in a college town, and one Halloween our doorbell rang and we opened the door expecting to see trickortreaters-- but what was in front of our open door--was another door! Like, a full-on wooden door, that had a sign that said "Please knock." So we did, and the door swung open to reveal a bunch of college dudes dressed as really old grandmothers, curlers in their hair, etc, who proceeded to coo over our "costumes" and tell us we were "such cute trick or treaters!" One even pinched my cheek. Then THEY gave US candy, closed their door, picked it up and walked to the next house.